After a clever catch up that further connected the dots in Person of Interest Season 3 Episode 16, the show is clearly headed down the final stretch of episodes and not looking to slow down anytime soon. Decima, Vigilance, the POI team,and even Root are all converging because the threat of a new machine, Samaritan, has the potential to go online. And that could be catastrophic not just for the Machine but people everywhere. Can you even imagine two super computers going toe to toe? What would that even be like? Where Reese, Finch, Shaw and Fusco spend their time receiving numbers and saving people, Root’s mission is much more focused. She’s trying to prevent Samaritan from being completed. And, of course, those goals often intertwine. There’s always a chance that connecting things too much can make the whole story feel contrived, but it never really does. And having a Machine that, in a way makes those connections feel natural, can allow something like a person of interest provide a backstory that connects to Root and her current goals, as well as that larger story. Even if the person of interest is only needed for the retinal scanner. On some level, we’re all connected. It was interesting to see Root slowly learn about her connections, even ranting to Finch about the chaotic world that doesn’t have that higher calling. The Machine gives her that purpose. But I loved Finch’s response about getting the Machine to care about people is what truly makes it work. It’s wild to think Root is even more connected after having that speedy surgery, but there’s still a human side to her and Finch clearly spoke to that. Root risked her life to save the person of interest rather than stop Decima from getting the chip. She isn’t the same as the machine she’s taking orders from - and it was good to see her shift roles if only for a moment. Granted, as overly exaggerated as a scene can be when she’s sweeping through the hallways guns blazing with such precise ease, it’s still a lot of fun. And Root is so odd in general with her quips and smiles that you want to root for her, even if you can’t help but not completely trust her. But it was intriguing to see Decima have certain ways to counter the Machine and they remain persistent as ever. And now with the chip retrieved, I have no idea what those dangerous consequences will be. For what purpose will they use Samaritan? Shaw did have kind of a side mission dealing with Vigilance, but I found it interesting to listen to Collier talk about having the same goals. The two just are going about it vastly different ways. It’s also nice to see Shaw take everyone out, much like Reese kicking and punching his own enemies during the hour. Fusco even got some good one liners in as well. 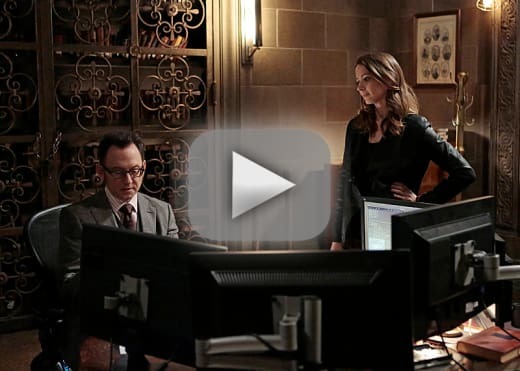 Person of Interest Season 3 Episode 17 was an exciting hour that continued to push the boundaries of the show. There’s never a dull moment as the mystery unravels, the characters entertain and the last seconds have you eager for more. Who's ready for next week? Do you think Root will die for the Machine?